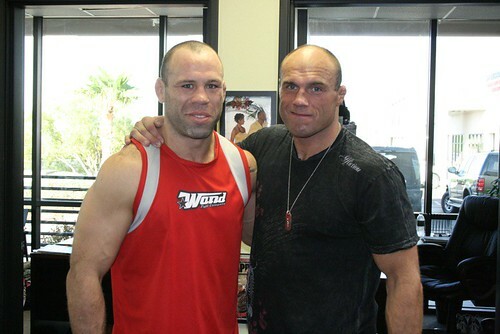 MMA legend Wanderlei Silva hit the gym in Vegas today. He’s in town for the next two weeks from the Fizogen-Xtreme Couture in Wellington, Florida. Wanderlei is helping Randy to get ready for Gabriel Gonzaga. As for his next fight, Silva tells us he’ll be stepping back into the Octagon on December 29th. He hopes it is against Chuck Liddell. After the UFC 74, you can catch Wanderlei at the Fizogen-Xtreme Couture MMA Training Center in Wellington, Florida. What a great news ! The both fighters have different techniques, differents styles, but with collaborating together, they could create the most powerfull one. Silva is the best fighter I’ve seen with knees and I hope help’s a lot Captain America! Ago 25, don’t loose this battle! this is going to be a bad camp i want to go! DEFICIL HEINNNNN , PARA O RANDY GANHAR ESTA LUTA E COM CERTEZA NAPÃO VAI SE CONSAGRAR DE NOVO CERTEZA ABSOLUTO ESTA LUTA ESTA GANHA …. It’s good that Wanderlei Silva is starting with Chuck Liddell. If he fought Rampage, he would take the title instantly because Rampage can’t get into the head of The Axe Murderer. If Wanderlei beat Chuck and then fought Dan Henderson for the UFC title, it would be the Ultimate Pride rematch. Meu caro amigo wand sou seu fã, mais gostaria de saber porque está apoiando o couture e não o brasileiro napão? Time to get down to Wellington and check out the big dogs! Very cool post – look how ripped Randy is!